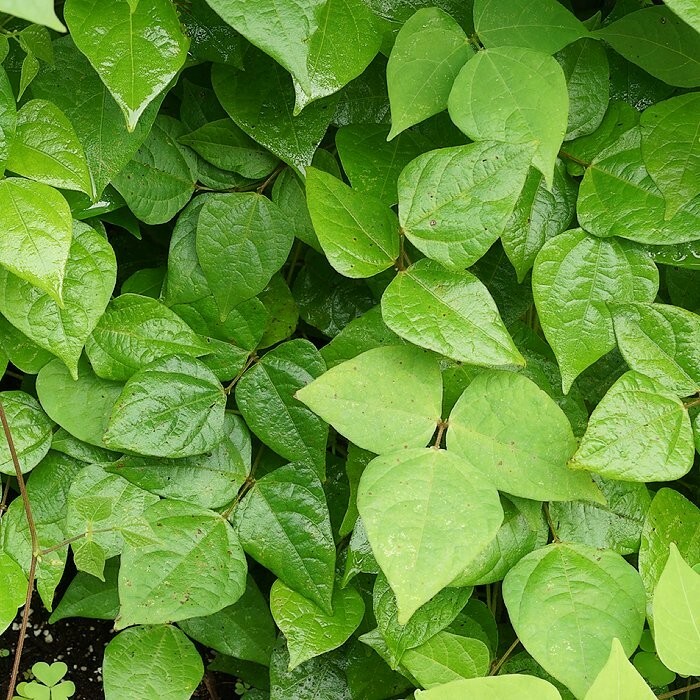 Also known as Thicket Bean, Bean-vine and Wild Kidney Bean this perennial climber grows in open fields and river plains and is easily cultivated in a variety of soils. Indigenous to North America, wild bean can be found in nearly every state, in Canada, Puerto Rico and Mexico. 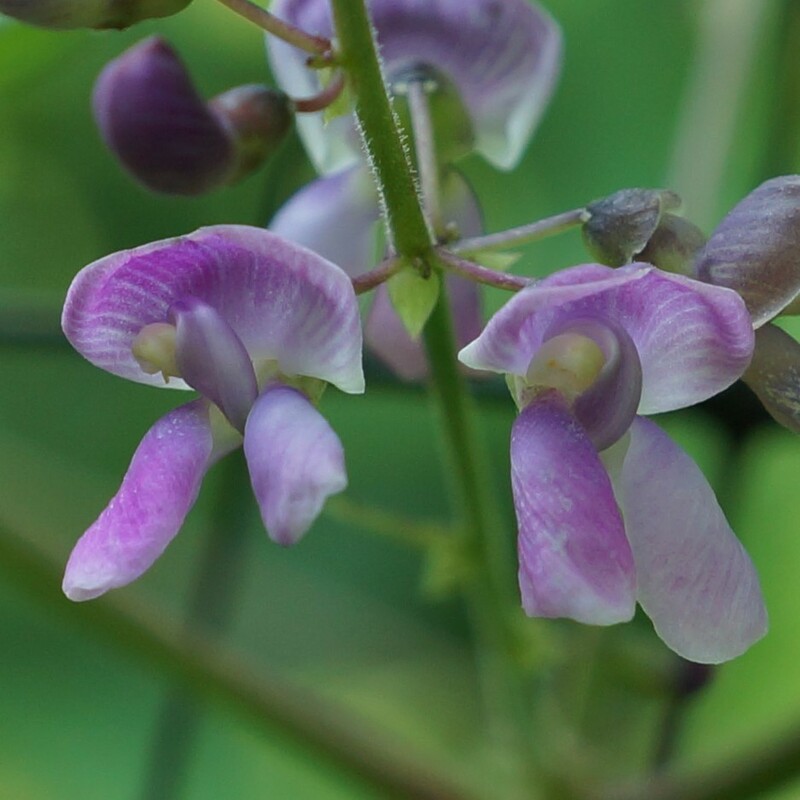 It has been found in many ancient archaeological sites and was probably the first bean to have been selected in North America prior to the distribution of annual beans. The high protein seeds have been cooked by Native Americans as a winter food source. But to be honest, its uses are not widely known past or present. Under cultivation wild bean grows best in full sun. Can get upwards of 20 ft tall when climbing with large side branching of the vines almost like a grape. Once established the roots are incredibly deep rooted and long lived. When you get your package of bean roots plant them right away like you would a carrot. Almost always wild bean roots set seed (beans) the first year but the 2nd year and beyond the plants really increase yields as the root grows in size. Plants are very responsive to fertilizer in their 2nd year making vines that produce side branches each producing many pods of small beans. Little is known about this bean plant and for this reason we have begun trials measuring yields, disease resistance and pollination issues. Roots are harvested when dormant in spring and fall. If we run out, then the next cycle starts in October where the harvest starts again.These are sold as dormant roots. We recommend a 2 inch mulch over them them the first winter which will aid in their survival. Flat rate shipping $9.60 USPS applies to this plant. Eastern U.S.-from northern most area along the east coast. Minus 20 F....root hardy into zones 5-6. 1-5 depending on trellis system. Plants branch profusely compared to other runner beans. For bean production use more than 2 plants for best yields as pollination plays a big role in yields. Does well in our sandy soil mulched.Said to grow in moist soil as well as rocky soil where the tap root can extract moisture deep into the soil. Seems to grow well anywhere beans can grow. Very easy to grow. 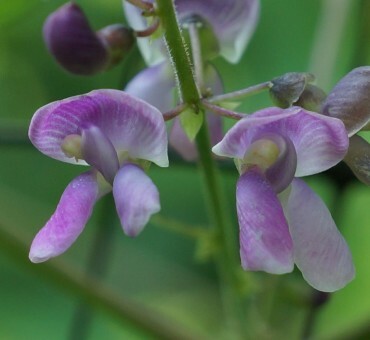 The small size of the bean may make it more of a novelty edible food plant at first, but eventually higher yielding plants could quickly be developed as well as possible hybrids with other species. Flavor should be more fully explored.